A number of well-known environments and operational scenarios exist in which GNSS signals cannot be tracked reliably. And these environments or scenarios are attracting the attention of those wishing to develop alternatives and backups to GNSS. Conditions that are difficult or impossible for GNSS operations are experienced indoors or other occluded environments where the low-powered satellite signals are blocked or unreliable. Moreover, jamming and interference can degrade these signals and represent a continuing threat, given the widespread availability of so-called personal privacy devices (PPDs). As PNT applications continue to expand strongly in consumer and commercial segments, demand is also growing for uninterrupted, ubiquitous, and seamless access to position/location information. In this context, “seamless” refers to an ideal situation in which PNT capability is continuously available in all environments, indoors and outdoors. Achieving this will necessarily require a PNT technology mix that may be characterized as GNSS+. To help us explore this issue further and assess the progress being made toward achieving ubiquitous positioning, we called on Dr. Chris Rizos, the head of the School of Surveying & Geospatial Engineering at the University of New South Wales, Australia. In the early 1990s Rizos established the Satellite Navigation and Positioning Lab at UNSW, an R&D group that focuses on GNSS and wireless positioning technology and applications. Rizos’s current research includes new positioning technologies and he has written and spoken widely on the subject of ubiquitous positioning. IGM: What are the leading non-GNSS sensor/positioning technologies today? RIZOS: Undoubtedly the most mature non-GNSS sensors are the ones based on a package of several gyroscopes and accelerometers, perhaps including a magnetometer and/or barometer. We may refer to this package by the generic label of inertial navigation system or INS. An INS can be very inexpensive (the components exist in smartphones), and due to the fact that no signal tracking is needed, INS can be very reliable. Inertial sensors cannot be interrupted in their operation by, for example, signal jammers. GNSS and INS present a textbook example of complementary navigation technologies, such that the integration of GNSS/INS is a classical solution to the positioning availability challenge. Furthermore, INS can provide additional information on platform orientation — although unfortunately it cannot provide timing. Even though INS does not suffer the vulnerabilities of GNSS signal non-availability/denial, it has its own weakness due to the growth in positioning errors over time. Hence, GNSS “updates” are required in order to regularly calibrate the INS sensor errors. A “new” class of sensor technology that is finding ever-increasing application comes from the robotics community. This uses vision and/or laser scanning sensors to provide relative positioning information. Integration of these imaging or optical systems with GNSS will become very popular as intelligent road vehicles gain autonomous driving/navigation capabilities. Positioning techniques based on “signals of opportunity” may also be considered very mature, but the accuracy/availability varies considerably. So, I won’t dwell on these. In fact, any RF signal of opportunity — WiFi, Bluetooth, RF identification/near field communications, cell phones, digital TV —can be used in a cell-ID mode of positioning and combined with GNSS. IGM: Are there non-GNSS positioning technologies under development that appear likely to improve the options for integration with GNSS to support ubiquitous positioning? RIZOS: Technological developments are occurring at a very fast pace. What drives cost down, and adaptation up, is large markets for non-GNSS solutions. Inertial navigation systems will improve in performance, but the rate of reduction in cost cannot be easily assessed, especially if the technology is largely restricted to military applications. The “fast performer” is image-based technology, as the basic technology components can be manufactured at low cost, and a potentially huge market exists in personal, robotic, and vehicle applications. Note that both INS and image-based positioning solutions — neither can provide precise timing — do not require any external infrastructure, such as signal transmitters in satellites or on the ground. Commercial and customizable ranging-based positioning systems such as Locata use some of the principles of GNSS and can provide high accuracy. However, they require not just user equipment, but also an investment in signal broadcasting infrastructure. Still, they can service an unlimited number of users. Hence, the cost of user equipment — the complexity is similar to GNSS receivers — can be reduced enormously, potentially at a level that is lower than a high-performance INS or quality image-based system. IGM: Which non-GNSS technologies that are currently or soon to be available provide accuracy comparable to GNSS that would be affordable for consumer markets? RIZOS: There are two classes of technologies. One is the vision/scanning sensor technology — referred to here as “image-based systems” — that can provide centimeter-level accuracy (under appropriate illumination conditions). The second is ranging-based positioning technologies described earlier. The former category will rapidly become more affordable as the vision/camera technology is no more expensive than a GNSS chip. With increases in volume sales (primarily to address the intelligent vehicle market), the cost of laser scanning technology will also drop rapidly. (There are already sub-$100 systems on the market.) The latter class of technology cannot be expected to drop in cost as rapidly as the former because no consumer mass-market applications exist for them yet. IGM: What are the main challenges facing design and manufacturing of ubiquitous positioning products? RIZOS: All non-GNSS positioning technologies face many more hurdles to acceptance than GNSS. GNSS is such a widely available, high-performance, and comparatively mature technology that it is hard to see it being replaced as the technology of choice to address positioning requirements across a broad range of consumer and professional market sectors. 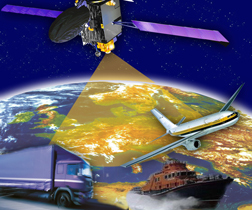 The challenge for non-GNSS technologies is to be as versatile as GNSS. Frankly, that is an impossible aspiration, and integrated GNSS/non-GNSS systems will involve trade-offs between accuracy, availability, cost, power requirements, form factor, and coverage. As a result there will be considerable fragmentation in positioning system options. Not only manufacturing (or other technical) challenges must be addressed, but also issues such as scalability, areal coverage, customer expectations, and product offerings. For example, a product optimized for warehouse positioning may be unsuitable for industrial applications, or for personal navigation. So, ubiquitous positioning has come a long way in the last few years, but it still has further to go to become a practical reality.